There’s been a ton of lunar eclipse related traffic today and the app has already used its quota of Google Maps API calls. Having this morning received another monthly bill from Google for $436, 90% of which is attributable to the free web app, unfortunately we can’t afford to increase the quota. Donations in support of TPE on the web have covered only 10% of the cost for Google Maps since the new charging model was introduced last summer. We’re very grateful to the 20 or so folks who have donated. Sadly, that’s only 20 out of ~174k users in the same period (~0.01%). The current plan is to remove Google Maps altogether and replace it with something more sensibly priced. However, that’s going to take a while longer as I have to carve out time from other projects to do it. We may offer a paid version that does include Google Maps (as they’re very, very good…). If you’re able to donate to support the running costs of TPE on the web, we’d certainly be very grateful (there’s a button on the right of the page). It has been available since March 2009 and has always been free of charge (we’d love to be able to keep it that way). Purchasing one of our mobile apps also helps! The quota resets daily, so things should be back to normal by tomorrow. Software, photography and music. Maker of @photoephemeris. 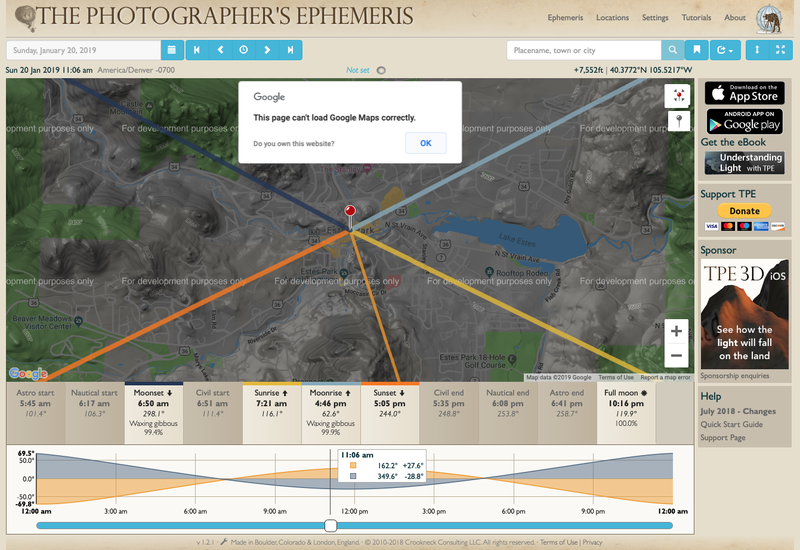 The Photographer’s Ephemeris (TPE) is a tool to help you plan outdoor photography in natural light, especially landscape and urban scenes. It is a map-centric sun and moon calculator: see how the light will fall on the land, day or night, for any location on earth.